Regular, on-going training ensures that our surveillance team is fully up to date with the latest developments in CCTV technology and monitoring techniques. Thoroughly IT aware, our staff have used 99% of all CCTV systems on the market. Meaning that in the event of any issue with your system, they should (all other things being equal) be able to get it up and running again with minimum down-time. Our wire free construction site CCTV system is aimed to take out the fuss and time consuming task of installing in those last minute situations. Installations can be completed within the hour so you will have a fully monitored building site CCTV system that protect your assets and eliminate costly call outs. 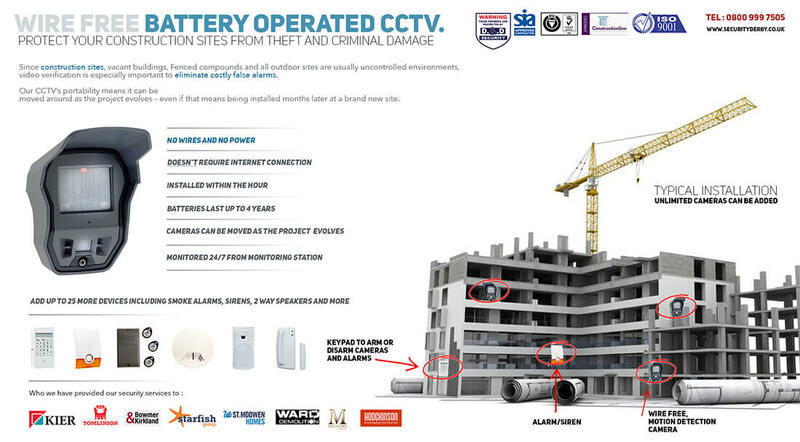 Why use our construction site CCTV? What type of cameras do we supply? We supply almost all types of CCTV, from IP or Hard wired set ups to wire free video verification systems (perfect for "off the grid" locations). Dome cameras are commonly used within the retail sector these sleek, none tamper CCTV cameras are designed to be unobtrusive but seen by members of the public to deter unwanted guests and potential thieves. The dome cameras give off a great feed and are available in 1080p HD. Majority of our cameras do have day and night vision capabilities however, some our systems project a higher definition of images during the night and low level lighting conditions than others. Using infared technology night vision cameras can project a black and white, very clear picture even in total darkness. Our wire free, battery powered CCTV is becoming increasingly popular with the construcvtion industry and estate agents/property developers. With super fast deployment and the fact it doesn't need power or an internet connection to be monitored around the clock is an incredible security option for construction sites and void/vacant properties or 'off the grid' locations. ip configurated cameras or networked camera systems are fastly replacing the older analogue CCTV as the new norm for many businesses, can be both hardwired or wireless installations these cameras work by transmitting images over cat5/6/7 cable and run through a network and can be accessed remotley via smartphone or tablet. Looking for CCTV for construction sites? Why not try our wireless, battery powered camera's. Our video verification cameras require no internet connection or power and are perfect for construction sites and "off the grid" locations. D&D Security Derbys wire free camera solutions are monitored from a 24 hour control station so should an activation occur we can send an SIA licensed security guard to attend an ensure their are no intruders or security breaches. D&D's wire free camera's are future proof meaning as the project evolves we can move the cameras to different locations to ensure optimal coverage is provided. How much are these cameras? Most of our clients choose to rent our wirefree cameras as projects begin and come to an end on a regular basis. Our wireless cameras for construction sites and vacant properties start from as little as £49.99 pw. Different projects have different needs, so dependent on the size and scale of the project the prices may vary. Please feel free to contact us on any of the below methods, one of our team we be more than happy to help.